This recipe was a request from Dave, from Maine. 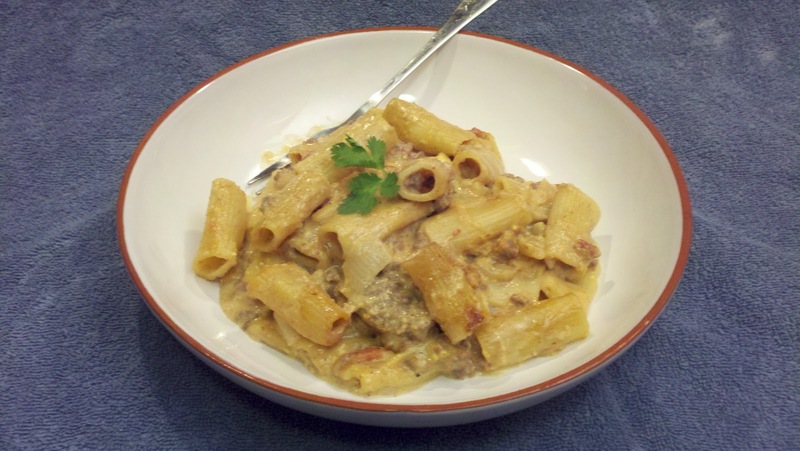 He loved the Crock Pot Pizza Pasta so much that he wondered if I had a crock pot cheeseburger mac recipe too. Well, I didn't have one, but it gave me the perfect excuse to come up with one! Dave especially liked the fact that you don't have to precook the rigatoni for the pizza pasta. You just open up a box and dump it in. So I made sure to use the same technique with the cheeseburger mac. And can I just tell you how delicious it is? It tastes just like a bacon cheeseburger! The secret is the ketchup and mustard. Don't forget to add them!! So, here you go, Dave. I hope you like this as much as you like the pizza pasta. And thanx again for writing to me! Btw, if anyone else is looking for a recipe, please send me an email! If I don't have what you're looking for, I'll either find it or create it! Great then. Cut up the bacon into small pieces and add to a large saute pan along with the chopped onion over medium heat. Saute until the onions are soft and the bacon is lightly browned. Add the beef and continue to saute until everything is cooked through. Drain excess fat. Add to a crock pot along with remaining ingredients. Give everything a good stir. Cook for about 5 hours on low or about 2 1/2 hours on high. I usually add all the sauce ingredients to the crock pot while the meat is cooking because it's easier to stir. I also give it a good stir about halfway through the cooking, just to mix it up a bit and to make sure it's not sticking to the crock pot. I used rigatoni (just like I did with the pizza pasta) because they're hearty enough to stand up to the crock pot cooking. I tried it with regular elbows and they overcooked and became too mushy. So, if you'd like to try another kind of pasta, be sure to choose one that's big and hearty and chunky like rigatoni. If you'd rather bake it in the oven, just follow the method of regular baked mac n cheese. Saute the bacon, beef and onions as usual and add them to a casserole dish with the boiled rigatoni (or other cut pasta). Melt the cheese into the milk (only use 4 cups instead of 5) and stir in the remaining ingredients. Then pour it over all and bake for an hour at 350F. Will definitely spread the word!!! On the recipe, and by all means stop by www.crockpotking.com, and feel free to roam around! And tell a friend! Candis, I'm thrilled that you like my blog! Browse around and email me if you need something specific! Thanx! I haven't tried a reduced fat version of this, but absolutely give it a try and let me know how it turns out! Overall I loved the Bacon Cheeseburger Mac, but the next time I will shorten the cooking time to 4 hrs and will make sure I crisp the bacon more before adding it to the dish. Hi what if we don't have velveeta cheese? I have cheddar though, making this right now!